Press Release – Mayor Must End London’s Illegal Truck Epidemic Now! Mayor Must End London’s Illegal Truck Epidemic Now! After yet another cyclist was killed by a truck at Vauxhall Cross, Stop Killing Cyclists have today (22nd June 2014) launched a petition calling on the London Mayor to set a target of reducing the illegally driven trucks on London’s roads down from its current epidemic levels (estimated to be over 30%) to a maximum of 1%. End the dangerous driver time-penalty systems used by TfL Buses and trucks used on the Crossrail Project. The full text of the petition is below. It is estimated that up to 30% of all trucks being driven in London were in an illegally dangerous state or were being driven illegally. “After yet another preventable killing at Vauxhall Cross we are calling for thousands of Londoners to sign this petition to pressure the Mayor to end the illegal truck epidemic on London’s roads and set a 2 year target to reduce illegality to a maximum of 1%, from its current estimated level of 30%”. 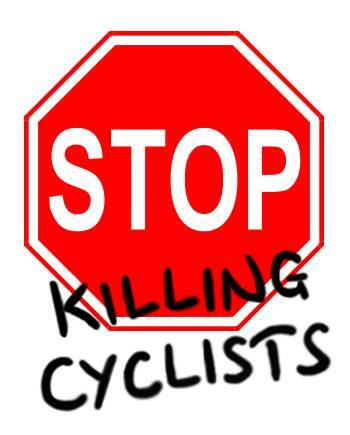 “Stop Killing Cyclists held a demonstration at Vauxhall Cross in December 2013, following the 6 awful November tragedies, calling for greater enforcement of truck safety regulations to protect London’s pedestrians and cyclists, yet almost nothing has changed. Dangerous illegal trucks keep putting Londoners lives at risk. 4. This press release was revised on 22nd June to add a quote from the author of the petition and to provide a clearer hotlink petition web address (item 2, above). “Following the tragic death of yet another cyclist at Vauxhall under the wheels of a HGV truck, Stop Killing Cyclists call on the London Mayor to urgently increase enforcement of Truck Safety Laws and set a target of pushing the level of illegally driven or in an illegally dangerous state trucks down below 1% by the end of 2015, from the current estimated 30% level. In London over half cyclist fatalities involve HGVs, despite HGVs making up only 5% of traffic . The Metropolitan Police found in one targeted action that as few as a third of lorries met safety regulations . 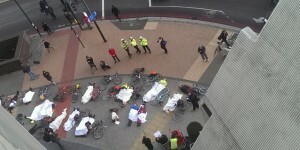 The police must step up enforcement efforts to catch dangerous lorries before they kill more Londoners. TfL and other bus and truck companies must stop using incentives which encourage dangerous driving, a practice which has been linked to the disproportionate number of accidents involving HGVs, especially those from the construction industry . A TRL study showed texting whilst driving could be more dangerous than drink or drug driving . Therefore it is unacceptable that TfL is using a text based system to communicate with bus drivers while they are driving.